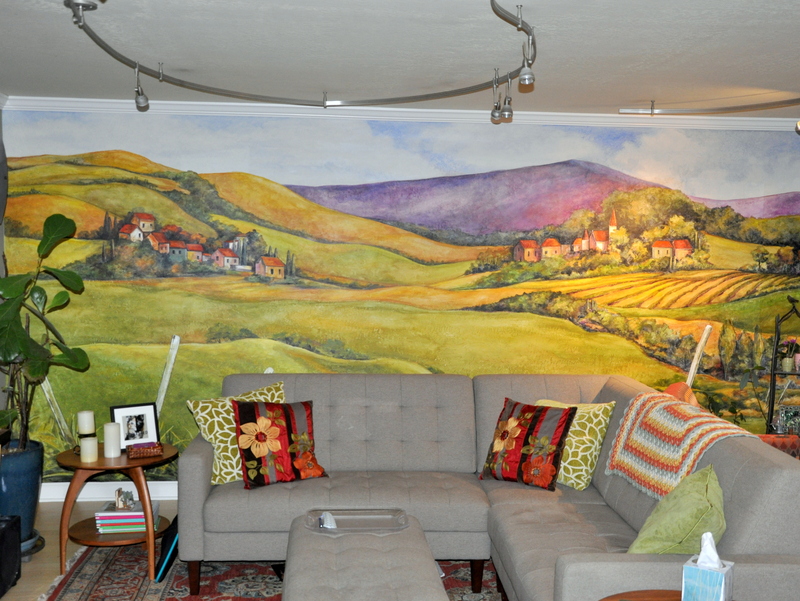 Our living room mural garnered lots of comments and interest when readers spotted it on my In A Vase on Monday post. I decided to write a little something about the artist and her process. I met Donna through our mutual friend Roger. Bodywork By Roger is in a nondescript building owned by a credit union, but when you walk in the door the space is stunning. Donna designed and painted the lobby and all of the rooms. I asked Roger for her contact information, and started referring her to my organizing clients and a few friends. I loved being able to peek at some of her projects and enjoyed seeing the breadth of her work. I’ve dreamed of a wall mural my whole life. I have magazine clippings of murals dating back to 1970, hoping one day the dream would become a reality. 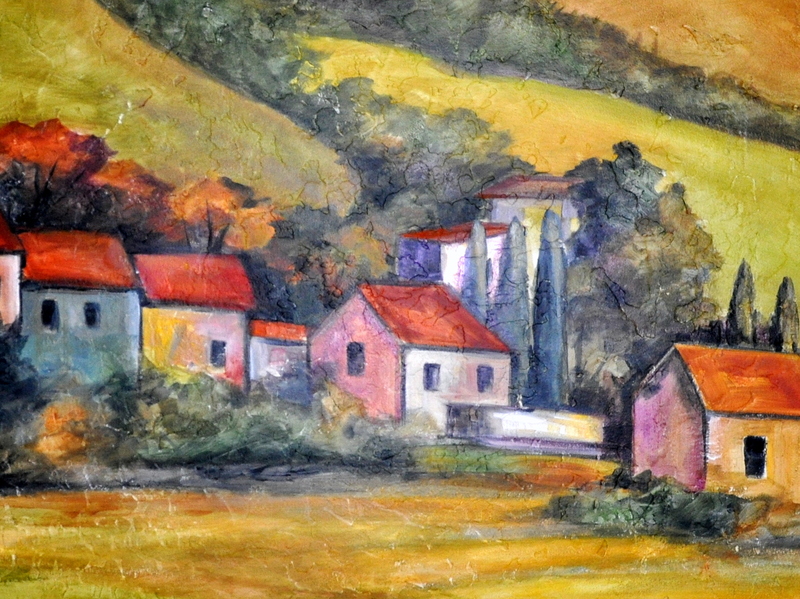 I came close once about twelve years ago, but I didn’t connect with the artist so the idea fizzled out. 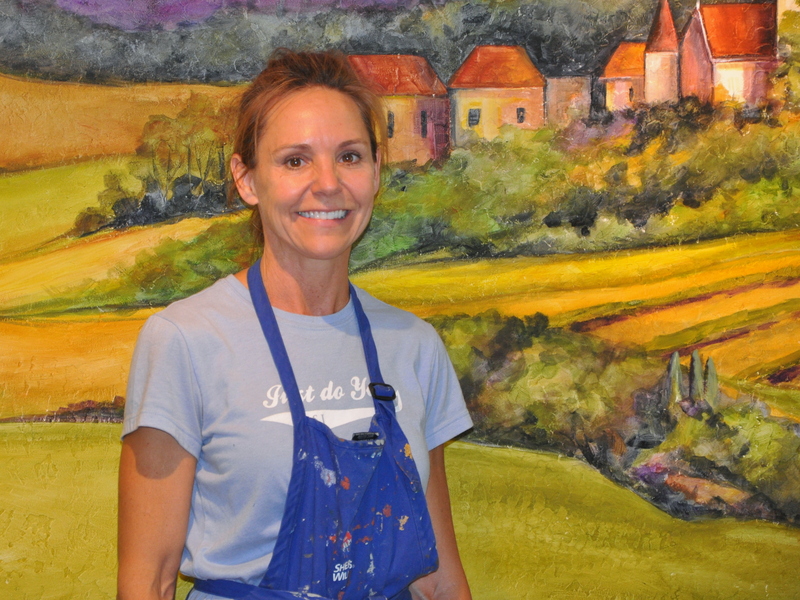 Donna took inspiration from a canvas we loved, creating her own colors and glazes to bring it to life. She sketched the idea, then literally drew a simple outline on the wall using an overhead projector. It was magical watching her work. Click on any photo in the gallery below for a closer look. 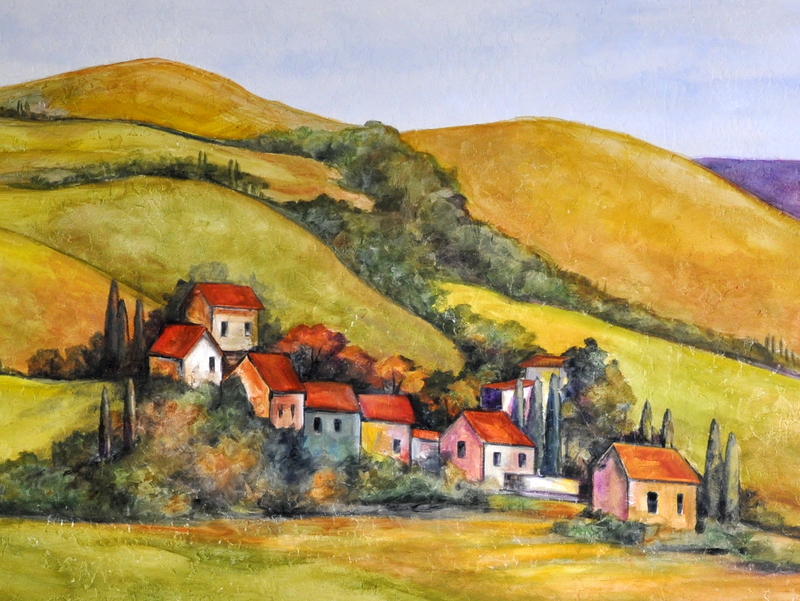 She painted over the course of a week, fleshing out the mural as she added fence posts, buildings and the beautiful sky. She even added a small cat to the stone wall at my request. See if you can spot the kitty. 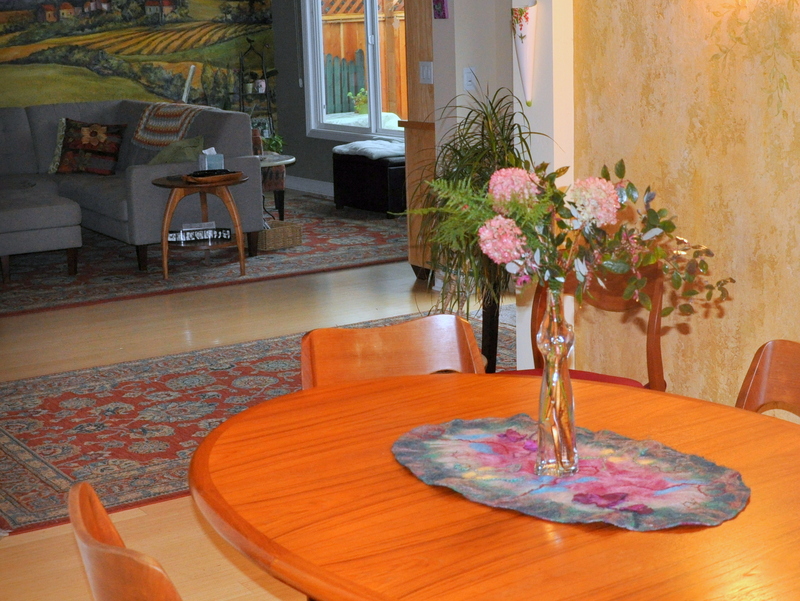 We have an open space plan with our kitchen, dining area, entry way and living room all flowing into an L shape. This allows us to see the mural from many angles for maximum enjoyment. One of the things I love about the mural is the way the colors change with the seasons or simply with the time of day. The mural always feels alive. It’s a tremendous privilege to have Donna’s work in my home. I’m glad so many of you asked. 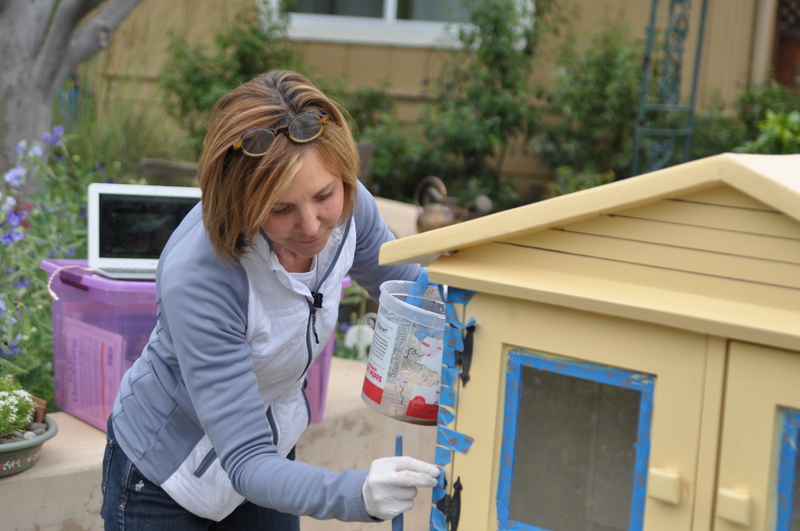 Of Note: You may recognize Donna as the artist behind our revitalized Little Free Library. 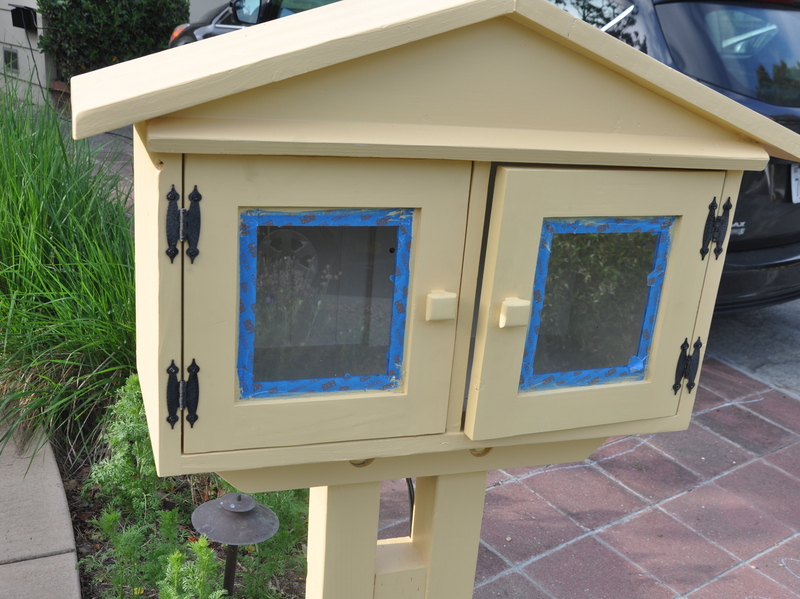 You can read more about that project on my post Our Little Free Library Becomes a Work of Art. 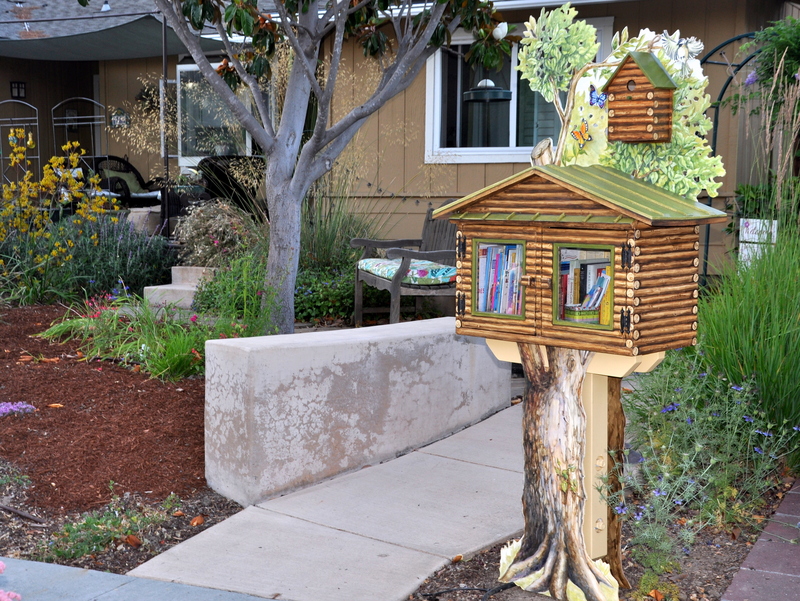 Our curbside Little Free Library is this week’s LFL Library of Distinction. This is a great opportunity to bring attention to our library, and a wonderful way to celebrate and promote Donna Pierre’s stunning work. Here is how the whole thing came about. After Donna put the finishing touches on our revamped library, I sent updated photos via the LFL website. They wrote back letting me know they would update the map within three days. Our registered Little Free Library is searchable via the world map along with 50,000 other libraries in over 70 countries worldwide. 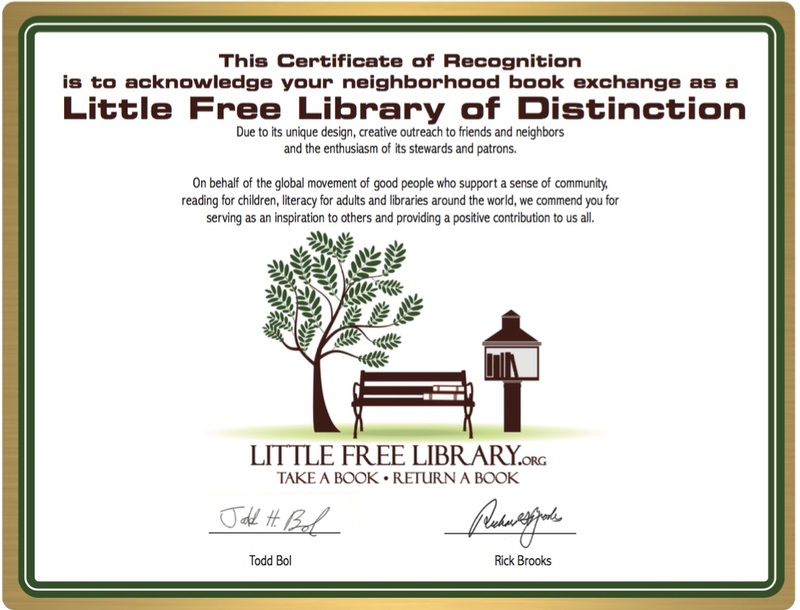 Through the Little Free Library movement, millions of books are exchanged annually. It is a joy to be a part of the movement. Congratulations! Your Library has been selected as a Library of Distinction. 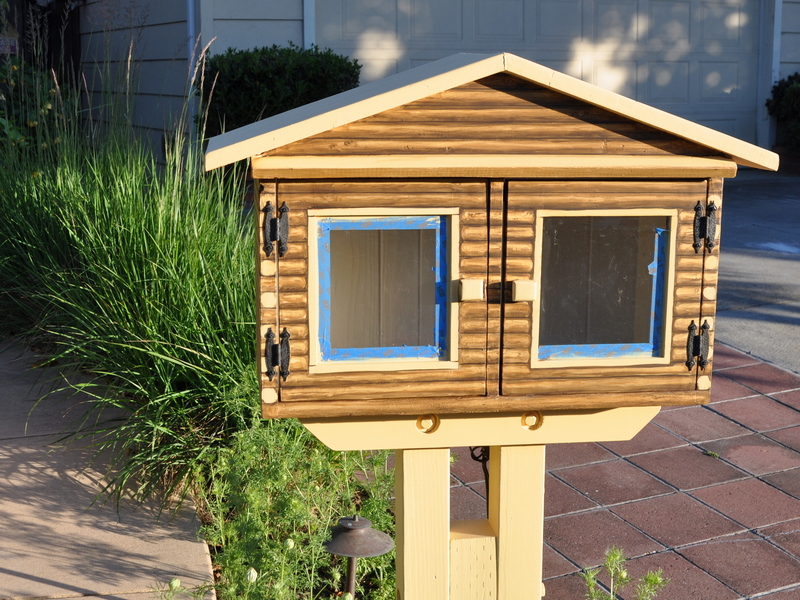 Its unique design and the creativity and enthusiasm you have put into it make it an inspiring example for other Little Free Library stewards to follow. 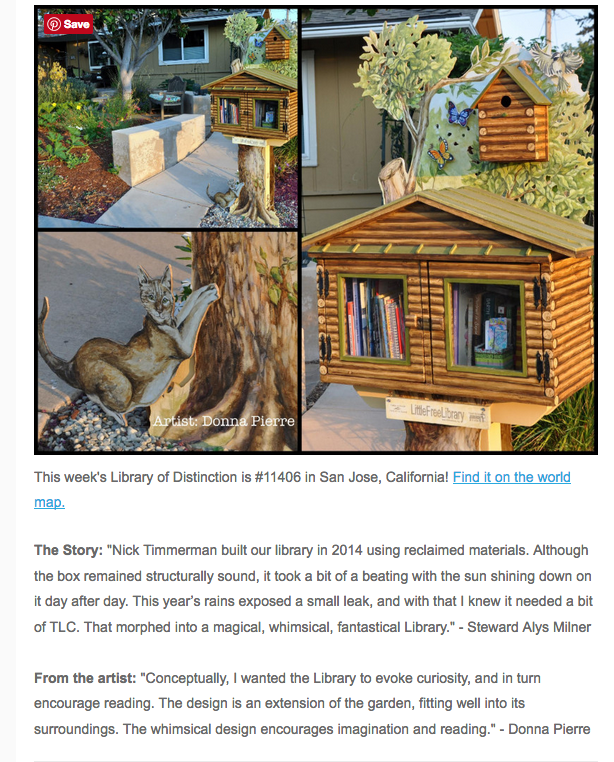 We will share images of your Library and the story behind it in our weekly e-newsletter to Little Free Library fans and on our Libraries of Distinction Pinterest board. If there are any details on your Library’s design or history that you’d specifically like to share in our e-newsletter, please respond directly to this email with that information; about 3-4 sentences would be perfect. Attached you will find a certificate to commemorate this achievement, please feel free to print it and show it off to all of your friends! Keep up the good work. Donna attached this handsome cat to the base of the library. I reworked the white sign by smudging it with green ink. Instead of re-attaching it to the face of the library, Mike installed cup hooks below the box for the sign to hang free. I didn’t want to do anything that would distract from Donna’s design. I rubbed green ink over the white sign to help it blend into the new design. Mike added cup hooks and hung it below the book box. 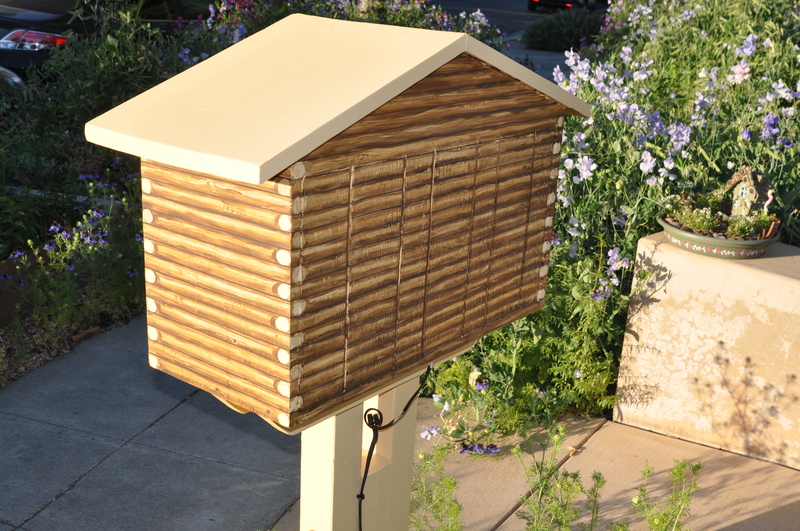 Feast your eyes on our redesigned Little Free Library. Thanks to the extraordinary talents of artist Donna Pierre, Our Little Free Library is now a work of art. My friend Nick Timmerman built our library in January, 2014. He used reclaimed materials, then added a small light connected to our low voltage landscape lighting. What a gem! Although the box remains structurally sound, it took a bit of a beating with the sun shining down on it day after day. This year’s rains exposed a small leak, and with that I knew it needed a bit of TLC. How’s that for exciting? 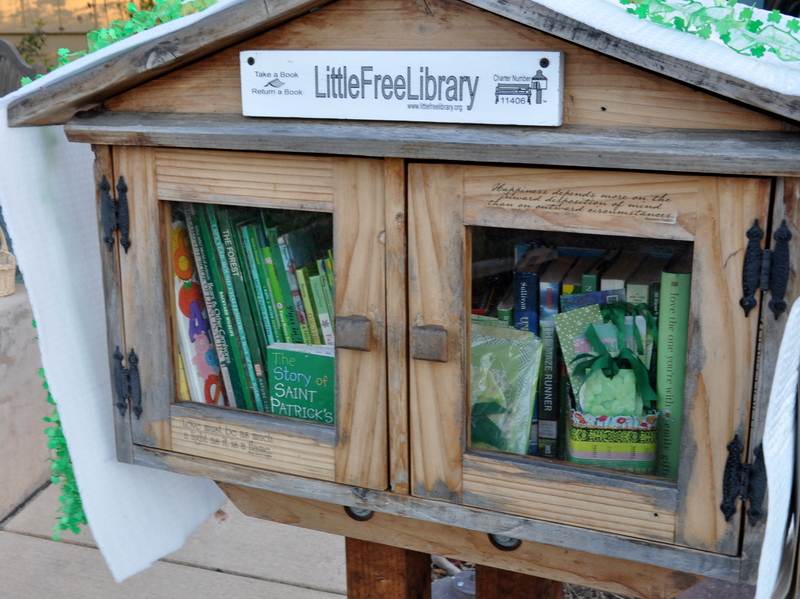 The idea of linking people with books and communities with tiny libraries is both simple and profound. It’s such an honor to be a part of it. In the early days of the library, I went searching for books. I asked friends and neighbors and occasionally searched our local thrift stores when children’s books were in short supply. Bloggers from around the world sent special books for the Little Free Library debut. Books arrived from Anne in Australia, Kelly in Canada and Julia from the state of Virginia. Pauline and Ann who are also artists, sent me a supply of bookmarks. My friend Barbara bought three large bins of children’s books at a garage sale and donated them to our library. When our neighbor Bernice moved house, she called and offered me several boxes of children’s books for a variety of ages. A neighbor a few blocks over regularly stops by and tidies the library. She leaves bags of books on my doorstep from Friends of the Library sales. My friend Kristi sent several books via Amazon in honor of our friendship and in memory of her Aunt Vicki. And twice in recent months, a neighbor I’ve never met pulled up to the curb and offered me several bags of children books. Just last week I received a box of books from Marlene at In Search of it All. It’s also fun watching the books come and go organically. The Little Free Library motto is take a book, give a book and it works. Here’s another gallery of photos showing Donna at work. A big thank you to Donna for sharing her talents. You can see more of her work here and here. When I spotted a Little Free Library in nearby Campbell in 2013, it was love at first site. The idea of my own Little Free Library held great appeal. It took awhile to bring it all together, but in January of 2014 our curbside Little Free Library or LFL made its debut. We dedicated the library in May that year and it’s seen a steady stream of visitors ever since. My friend Nick Timmerman built the library using reclaimed materials. It’s held up well, but last year it started to leak. I had to cover the library with recycled packing material to keep it operational during our wet winter. It’s been unseasonably hot these past few days, after a week of unseasonably cold weather. You never know these days which end is up. Once the weather improves, Donna will be back. I’m so excited. 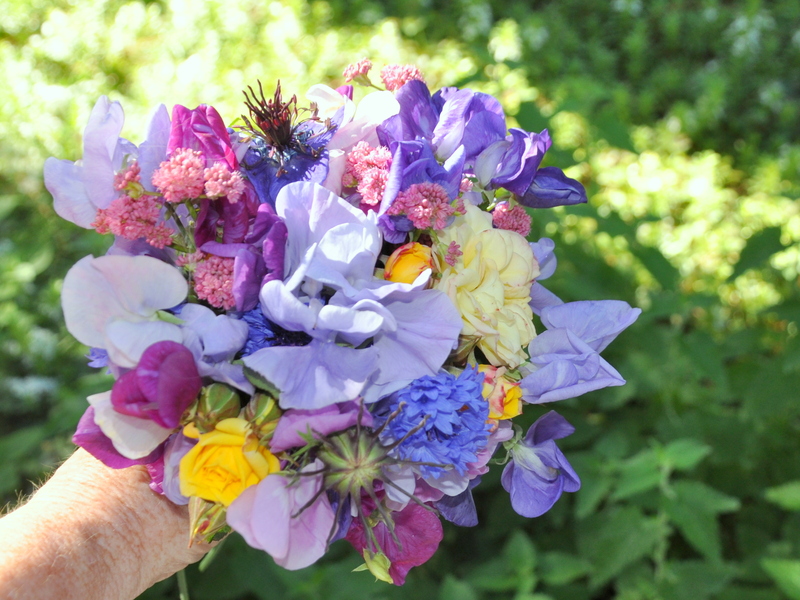 As you can see from the last photo, my sweet pea jungle is wilting from the heat. I knew it was inevitable, but I’ll be sorry to see them go. The Nigella (love-in-a-mist) are filling in some of the vacated spots, and the cornflowers are hanging in there too. The bees love the Nigella and I love the bees so three cheers for synchronicity. My sister stops by every Sunday to pick up a small bouquet for her friend, Kathee who is on hospice. This past weekend I added three miniature yellow roses to the small bouquet. It’s been nice to bring a bit of color to her day.